Relinquishing control and letting things happen organically has led to some of the best Polaroid photos in my collection. On the flip side, having a preconceived notion of how a shot should look and spending a lot of time setting it up has led to disappointment... Much like life as a whole—if I just let go, it often works out better for me. Jimmy Fallon took a picture of his eye with his cell phone and blew it up so he had this big eye. He then put it over his real eye giving this weird, almost creepy image. So I took a Polaroid photo of Jimmy doing that. Questlove also did it and I got the same photo of him. Polaroid photos can fade over time, so it's hard to see it clearly now, but it was a really cool optical illusion of sorts. Was a spur of the moment photo opportunity. I used the older stock Polaroid film with these, and they've since fixed the process to the fading doesn't happen as much as it used to. 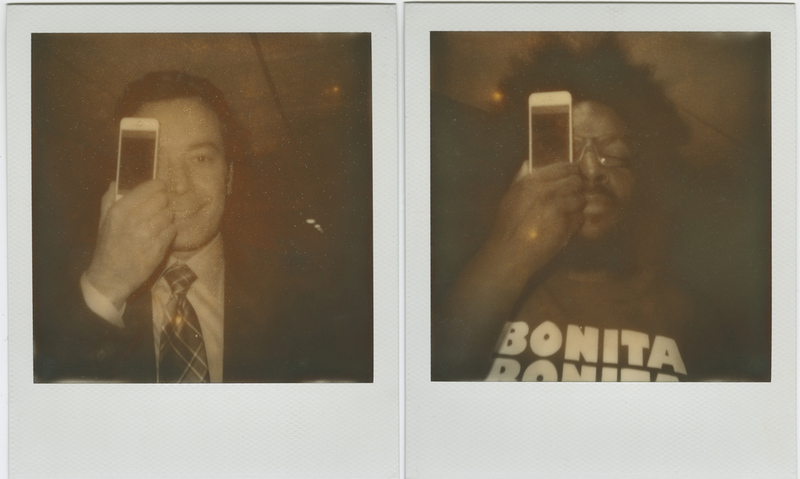 I took these photos when I was on the Jimmy Fallon show jamming with The Roots a few years ago. I'm excited to go back on the show on June 6th to talk about my new book Of Potato Heads and Polaroids. It's always fun. All those guys are great musicians and I love improvising and trying to keep up with them!